Complex commercial litigation typically involves numerous claims, multiple parties, and multi-faced, complicated legal issues. Our firm counsels companies and individuals involved in complex civil litigation in both federal and state courts. 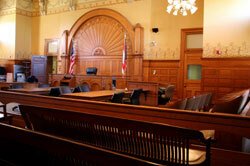 Our attorneys are experienced litigators that concentrate on business and financial matters. Whether you are contemplating legal action or were recently served with a lawsuit, we provide representation at every stage of legal process. Sallah Astarita & Cox, LLC also serves as local counsel to law firms nationwide.